Provide comfort for the family of Anna Cologna with a meaningful gesture of sympathy. COLOGNA- We are very saddened to announce the peaceful passing of Anna Cologna, who died on Tuesday, February 19, 2019, surrounded by loving family, at the T.B.R.H.S.C. after a long, hard battle with cancer over 7 years. Anna was born on July 22, 1953 in Castel Petroso, Italy. 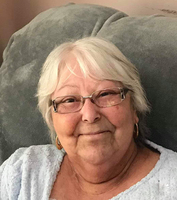 She moved to Canada at 2 years of age and resided in Ignace for 52 years, where she grew up with her younger brother Peach (Angelo) and older sister Liliana. She unconditionally loved and cared for her nephews Lance, Shane and Kelly. Anna married Ferrucio Cologna in 1981 and they shared in 37 amazing years of marriage. Together they were gifted 2 beautiful children, daughter Gemma and son Dylan, who will forever remain her most cherished treasures. Her greatest pride and joys included her grandson Meryk and all her fur-babies: Coco, Maximus, Rexy and Augustus. Anna also enjoyed knitting and crocheting as well as spending may hours gardening and tending to all her beautiful flowers. Her greatest joy came during time spent with family and friends, cooking and baking with love. Funeral services will be held on Tuesday, February 26, 2019 at 2:00 p.m. in the Sargent & Son Funeral Chapel, 21 N. Court Street, with Rev. Luigi Filippini presiding. In lieu of flowers memorials in Anna’s name to the Canadian Cancer Society, Firefly- Children’s Mental Health Ontario or the charity of your choice would be appreciated. On-line condolences may be made at www.sargentandson.com. To send flowers in memory of Anna Cologna (Notte), please visit our Heartfelt Sympathies Store. Provide comfort for the family of Anna Cologna (Notte) by sending flowers. My sincere condolence to the family for their loss.